Morocco’s energy challenges lie at the intersection of the country’s development and climate challenges. 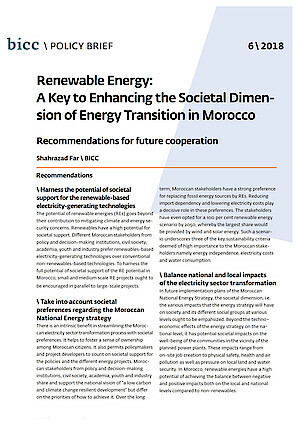 In BICC Policy Brief 6\2018 “Renewable Energy: A Key to Enhancing the Societal Dimension of Energy Transition in Morocco” Shahrazad Far gives recommendations for future cooperation. The potential of renewable energies (REs) goes beyond their contribution to mitigating climate and energy security concerns. Renewables have a high potential for societal support. Different Moroccan stakeholders from policy and decision-making institutions, civil society, academia, youth and industry prefer renewables-based electricity-generating technologies over conventional non-renewables-based technologies. To harness the full potential of societal support of the RE potential in Morocco, small and medium scale RE projects ought to be encouraged in parallel to large-scale projects. There is an intrinsic benefit in streamlining the Moroccan electricity sector transformation process with societal preferences. It helps to foster a sense of ownership among Moroccan citizens. It also permits policymakers and project developers to count on societal support for the policies and the different energy projects. Moroccan stakeholders from policy and decision-making institutions, civil society, academia, youth and industry share and support the national vision of “a low carbon and climate change resilient development” but differ on the priorities of how to achieve it. Over the long term, Moroccan stakeholders have a strong preference for replacing fossil energy sources by REs. Reducing import dependency and lowering electricity costs play a decisive role in these preferences. The stakeholders have even opted for a 100 per cent renewable energy scenario by 2050, whereby the largest share would be provided by wind and solar energy. Such a scenario underscores three of the key sustainability criteria deemed of high importance to the Moroccan stake- holders namely energy independence, electricity costs and water consumption. In future implementation plans of the Moroccan National Energy Strategy, the societal dimension, i.e. the various impacts that the energy strategy will have on society and its different social groups at various levels ought to be emphasized. Beyond the techno–economic effects of the energy strategy on the national level, it has potential societal impacts on the well-being of the communities in the vicinity of the planned power plants. These impacts range from on-site job creation to physical safety, health and air pollution as well as pressure on local land and water security. In Morocco, renewable energies have a high potential of achieving the balance between negative and positive impacts both on the local and national levels compared to non-renewables.